Over the last ten years or so, and around my various “off the farm” work schedules, I have learned a bit about gardening, preserving food, sewing, quilting, raising livestock and even the occasional butchering. I generally take these little projects on during the winter when things slow down a little and some of the fruits of my labor can, conveniently enough, serve as Christmas gifts for friends and family. In the winter of 2002, I decided to try raising a few home milkers, in the form of dairy goats. After much research via the internet and books on the subject, I chose Nigerian Dwarves because of their small size and generations of official milk production records. Our small 3+ acres seemed best suited for a miniature dairy goat. I carefully chose 6 does and 3 bucks to start our herd. I intended to sell enough kids every spring to buy the hay during the summer. I planned to make cheeses and yogurt for my family with the excess milk. The fall of 2003 rolled around and as I was investigating goat’s milk recipes, I found a basic recipe for goat’s milk soap. Wow! Soap! I had recently began collecting the supplies I would need to make my first candles and I decided the combination would make excellent Christmas gifts. By, the time I had those orders made, there was a pretty good bit of word-of-mouth advertising going on. Sometime in October, a lady passing through town ordered 47 bars for resale in another state. A week after that, the curator from an area museum asked me to supply their gift shop. The local newspaper came out to our little farm and we made the front page. The individual orders for gift sets and gift baskets meant very little sleep for me during November and December. As it became clear to me that a little hard work might turn this new hobby into a profitable business, I began researching the rules and regulations regarding packaging, labeling and marketing of home made soaps. I also decided to start looking into a liability insurance policy. Again, the internet was an invaluable tool for this project. I chose to label my soaps with plain address labels. I use the computer to print our business name, location, telephone number and a list of ingredients. I also print, or handwrite, the name I’ve given that fragrance or style. I stayed with my simple recipes. The ingredients are readily available to me and my customers like the products. I have found my market. There are many soap makers for a customer to choose from. The soaps at craft shows and on the internet are getting more and more fancy. With more expensive butters, additives and custom oil combinations. I considered changing my recipes, dropping the lard and adding herbs or flowers. I may still develop an herbal line of my own. But right now, my customers are people who really seem to enjoy the simplicity of my products. I list my ingredients, in order of the amount used, right on the label. I have never lost a sale because my labels say “lard” and “lye” right up front. 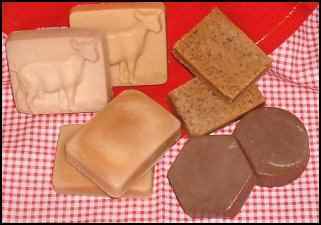 While there are people who would not feel comfortable using a soap made with animal by-products, because I use goat’s milk in every bar, there is no need for me to waste time and resources trying to find a spot in that market. Initially, to fill all the new orders and meet the Christmas deadline I had to invest more money in equipment than I had planned. I was and still am learning how to make soap. Every new recipe and every custom order means a little more trial and error. I had to buy more molds to meet the demand and I bought specialized molds for the custom gift baskets. Also, several botched batches meant losing precious time and some expensive ingredients. Since I had been buying supplies and materials a little at a time, the total start-up expenses were spread over a much longer period than they would have been if I had started making those purchases with the intention to go into business. Soap making, as a business has been ideal for me. There are several reasons. First, I already have the goats milk, which is the one ingredient that distinguishes my soap from competition in our area. Secondly, the “off farm” supplies I need are right down the street at the local grocery store. Next, the equipment needed can be purchased inexpensively. For example, my scale, plastic utensils, mixers, blenders, etc all came from Wal-Mart at prices ranging from .97 to 39.97. The molds can be purchased as well, but for those first batches, I used old cardboard boxes, lined with freezer paper. And lastly, I enjoy the work. It’s easy to put in a 16 hour day. I was sure the business would come to an abrupt halt after Christmas but that’s not been the case at all. I changed my marketing after the holidays and started making baskets for birthdays, anniversaries, baby showers and bridal showers. I have found new suppliers for most of the products and ingredients I use in order to add more variety and cut expenses. I also invested in a website. The cost for a website is minimal compared to the interest it has generated, so far. I am so fortunate to have the twenty-first century tools to help market my “days past” products. Now, I am constantly looking for new recipes to try and products to add to our sales list. We’re making soaps, bath fizzies, lip balms and several different styles of scented waxes and room fresheners. My mother has taken up candle making and supplies us with coordinating candles at reasonable prices. I love being at home and doing so much of what I truly enjoy. I think it must show because the response has been overwhelming. We now have a business license and the whole family pitches in to keep the goats cared for and the soap shop well stocked. Not including the expense of the goats, we invested around $800 in our soap business this year. From September of 2003 until December 31, 2003, total sales were a little over $1700. We cleared just under $1000 during the holiday rush. The goat herd is still our first priority and now our “girls” are paying for way more than their hay! First, I put the lard on the stovetop at my very lowest setting. I recommend using rubber gloves, long sleeves and safety glasses for every step after this point. You can just dump the lye into the milk and stir enough to get the lye dissolved if you aren’t worried about the color of your soap. I’ve done it this way with no problems, but the more slowly you add your lye, the lighter the color of your soap. Also, if you allow the lye to heat your milk too quickly, you will get a sort of burnt/soured milk odor to your soaps. I watch the lard melting while I stir the lye/milk mixture and quickly remove the melted lard from the burner as soon as there are no solid pieces left in the pot. Let the soap set in the mold for 12-24 hrs, unmold and cut bars. This soap will be cured in about 3 wks. By making a small batch like this, I can turn out 3-4 different fragrance/color combinations per day. I use one of several online lye calculators when I want to change a batch around. You just type in the type of fat or oil and the amount and the calculator will tell you how much lye and liquid to use.